I spent more than three months one year in an enforced almost immobile position because of complications from a back injury. When I finally started to recover and could be up and around again for part of the day, the recommended at home therapy was to walk as much as I was able to. As a surprise, my husband decided to build a walking path that would trail around our property and wind past the nearby wooded area. He took great pains to ensure that the surface of the walking path was smooth and level and that the path would take me past the garden areas that I love and had missed so much… alongside the little babbling brook and past all the froggy activity going on around our small pond. His thoughtful surprise turned my daily (sometimes very difficult and painful) exercise routine into something I could actually look forward to because there was always something new going on somewhere for me to see and enjoy. When the seasons changed and the gardens started to shut down for the winter, I had all the colorful foliage as my walking backdrop. 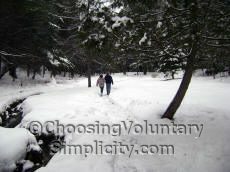 I wondered where I would walk when there was snow on the ground, but my husband told me he had already thought about that, and he was confident he could keep the path open and cleared of snow. 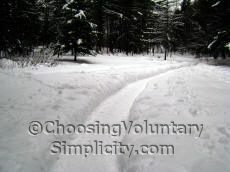 Despite the many snowstorms we had that winter, my path always was cleared and ready for me when I was ready to walk. And there was always someone willing and eager to walk around the path with me… over and over again… until my ever-increasing exercise time has been accomplished. The special closeness that we shared during these walks is something I will always cherish. One day after yet another snowstorm, we started our journey down the path, and as I turned the first corner I was surprised to see a jaunty little snowman waiting to say hello. He was so cute and so unexpected, I burst out laughing. 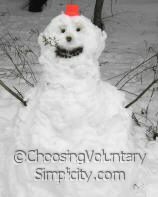 And then I thought about how my husband had taken the time on that frigidly cold day to pack the snow into the snowman shape (because it was too cold and the snow was too dry to roll) because he wanted to give me something cheerful and happy to see on my walk. 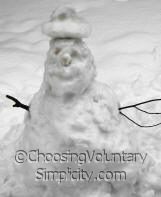 He had even managed to find a bright red detergent bottle cap to use as the snowman’s hat and had walked deeper into the snow to gather twigs and pieces of dried plant material to serve as the snowman’s features. That day each time we came around again to that point of the path, seeing the snowman made me feel happy all over again and so thankful and grateful for my husband’s thoughtfulness. After that, many more snowmen suddenly appeared at odd points along my path. Some were destroyed by rain, but in a few days another one would pop up again, and each one always brought a smile and a lift to my spirits. And every day when I headed out for a walk on my path, I was reminded of how much I am loved. And that it is possible to show love in so many ways. Showing you care doesn’t require expensive gifts or showy gestures. It’s the simple things from the heart that really count. What a thoughful man. You are a blessed woman. Natasha, he is… and I am! this story brings tears to my eyes, for I too have the honor of being married to a loving and kind hearted man like your husband. when I was 19 I was diagnosed with liver cancer. five years and three major surgeries later, my husband is my biggest support. when I was recovering he would do enything to bring a smile to my face. 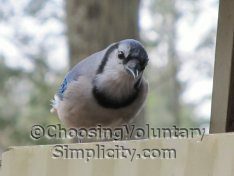 I remember feeling confined inside, so he went and bought a squirrel feeder and mounted it on the tree facing the window so I could watch the squirrels play and eat during the day while he had to be at work. he would also call my friends to stop by and visit me when he knew that I needed a boost. At the age of 24 and 26 I feel our relationship is more rich than that of some couples in their 50’s. its the simple things in life for which to be grateful. Kerri, I know exactly what you mean about how a crisis can strip out all the stuff that isn’t important and show you what is. The “simple things” that many people don’t even think about are really what make life and relationships meaningful and rich. Thank you for sharing your story. My first time to your site and I love it! My first read was on washing dishes and I went and loaded my sink up! Thanks for the motivation. I enjoyed reading about your walking trail and the snowmen. It reminded me of a quote I once read,”To love and be loved is to feel the sun from both sides.”-David Viscott. Your love for one another is evident in that story… His for you by building the trail and snowmen,and yours for him through the telling of the story and the evident pride and love you convey doing so. I hope you both enjoy many, many years of ” feeling the sun from both sides”. Kat, welcome… and I’m glad you’re enjoying my blog. What a lovely quote… thank you so much for sharing it. I do so love your website! Like you, I had a very paced up, yet purposeful, life working in a London hospital but the hours of travelling each day in crowded trains took a lot out of me! When I retired I decided to live a much simpler life. I moved to beautiful North Wales, UK to be near my sister who has major spinal problems. I’m now launching into all things natural and recently started making toiletries for friends and family. Life is so rewarding now there’s time to see the sunrises and sunsets and all the other wonderful colourful creations of nature that God has endowed us with. Thank you for blessing us with such a wonderfully inspiring website.